Legal scholar and economist D. Bruce Johnsen offers a fascinating perspective on indigenous cultural practices in “Salmon, Science, and Reciprocity on the Northwest Coast,” a recent paper in the Resilience Alliance open-access journal, Ecology and Society. [T]he salmon husbandry hypothesis (SHH), holds that the tribes had substantial knowledge of salmon population dynamics, that they actively accumulated and perpetuated this knowledge, and that they used it to engage in purposeful husbandry of their salmon stocks. This claim of “salmon husbandry” might seem unremarkable. After all, in the terrestrial environment, the idea that Native Americans used fire for wildlife, crop and pest management has gained much attention. In the Ecotrust office where I work, anecdotal discussion of Native salmon management would seem to point without hesitation to Johnsen’s conclusion. Moreover, couldn’t this type of purposeful husbandry describe the intentions or activities of every watershed group along the West Coast? What Johnsen theorizes is that long-term scientific knowledge gave rise to the Northwest Coast’s particular institutions, including: exclusive rights to fishing locations, the use of fish weirs for trial-and-error fishery experimentation and potlatch ceremonies for social ranking, reciprocity and buffering of environmental shocks. Influenced by the peculiar biology of Pacific salmon, these institutions effectively functioned to resolve conflict, promote technological development, provide reliable information, provide feedback about the environmental effects of resource-harvesting decisions, and encourage the accumulation and transfer of relevant knowledge. One institution that Johnsen proposes for contemporary salmon husbandry is a return to terminal fisheries, targeting stocks on a river-by-river basis, a system that would offer precise feedback mechanisms for coastal watershed groups. 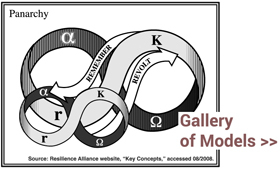 As a student of knowledge management and theories of change, I greatly appreciate Johnsen’s analysis and would seek to explore its boundaries, to understand his writings – or what I know of them, from the two papers referenced here – within a larger context. Take the case of a given society in which improvements in institutional design are understood – yet seem to be socio-politically unachievable.